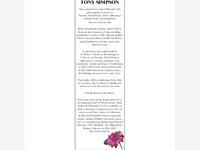 TONY SIMPSON Tony passed away peacefully and with great dignity at home on Tuesday 5th February 2019, following a spirited battle with leukaemia. He was 78 years old. Beloved husband to Jenny, father to Rob, Paul and Jon, brother to Colin and Mike, grandfather to Daisy, Felix, Megan, Emilia, Oliver, Clara, Freddie, Camilla and Monty, great grandfather to Poppy and a dear friend to many. A funeral service will be held at St. Mary's Church in Woodbridge at 1.30 p.m. on Tuesday 19th February, followed by a private cremation to be attended by family members. A Celebration of Tony's life is to be enjoyed afterwards at The Table Restaurant in Quay Street, Woodbridge between 4 p.m. and 7 p.m. 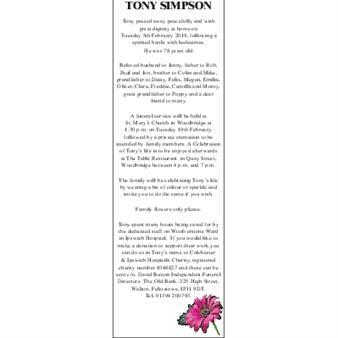 The family will be celebrating Tony's life by wearing a bit of colour or sparkle and invite you to do the same if you wish. Family flowers only please. Tony spent many hours being cared for by the dedicated staff on Woolverstone Ward in Ipswich Hospital. If you would like to make a donation to support their work you can do so in Tony's name to Colchester & Ipswich Hospitals Charity, registered charity number 1048827 and these can be sent c/o. David Button Independent Funeral Directors. The Old Bank. 225 High Street, Walton, Felixstowe, IP11 9DT. Tel. 01394 200793.